Fr. 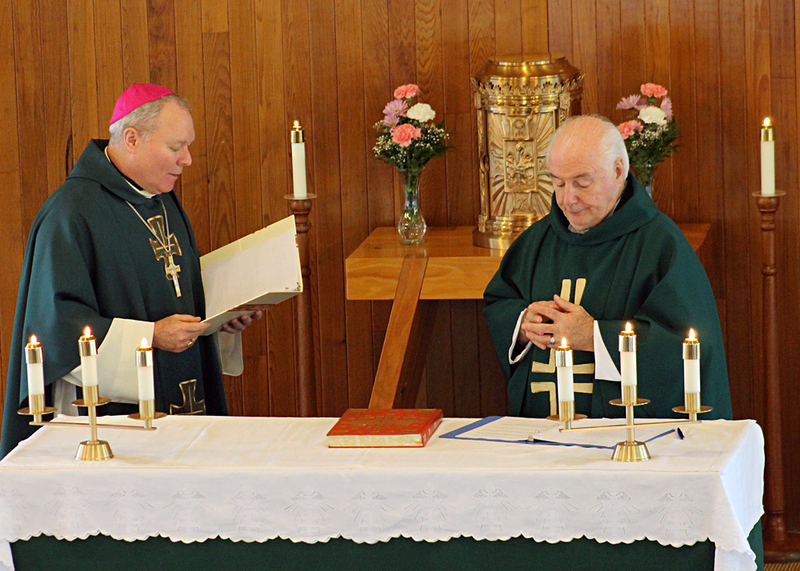 Jim Blaney, OMI, (at right) during his Mass of Installation at St. Gregory’s Church in Sitka in 2011. Fr. Blaney died in Sitka on December 4, 2013 after a brief illness. As you are aware in reading the initial pages of this diocesan newspaper, we have lost a good friend and a faithful servant with the death of Fr. James Blaney, OMI. In one of my first trips on the Alaska Marine Highway, I accompanied Fr. Blaney to one of our missions. It was during this trip that I recognized the love he had for the people of Southeast Alaska and the great appreciation they had for him. As I witnessed and listened to his conversations with everyone (and I mean everyone), I quickly dubbed him “the ambassador of the Catholic Church”. As I write this article two days before his funeral, I want to express my appreciation to the parishioners of St. Gregory’s parish in Sitka. I have witnessed their love, care and concern for Fr. Blaney during his illness and at the time of his death. In addition, I recognize how steadfast they are in the faith and I’m grateful for their many ways of showing commitment to the Church. To the parishioners of St. Gregory’s – thank you for your demonstration of what it is to be a true Christian community. I am truly humbled and honored to be your shepherd. In addition to the faithful of St. Gregory’s parish, I must say a word of appreciation and support for Fr. Pat Casey, OMI. Fr. Pat has always exhibited the traits of a true man of the Church. During the last days of Fr. Jim’s life, Fr. Pat was exemplary in his fraternal care for Fr. Jim, and he also served the parish well during this time of transition. As we mourn his death, we hold on to the sure and certain hope that Fr. Jim has now entered into God’s loving embrace. We commend his soul to the mercy of God and offer prayers of thanksgiving for his many years of priestly service within the diocese of Juneau. Father Jim loved the people of Southeast Alaska. With his death comes the beginning of eternal life. At this time I also want to express my gratitude to the wonderful staff of the Diocese of Juneau. In this issue you will see images of the second Synod of the Diocese. The Chancery staff worked long and hard in bringing forth this Synod. In particular, Fr. Pat Travers served as the chair of the Synod commission and Ms. Peggy Matson, ably assisted by Mr. Barry Schoedel, was stellar in pulling together the details. Deacon Charles Rohrbacher coordinated with much care all the details of the various liturgies. The many people who came from the missions and expressed their appreciation for our celebrations. Ms. Lisa Lindeman served as our moderator and graciously facilitated the discussions and guided the three day Synod through our various topics. 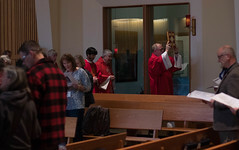 In addition to those named, a whole host of others worked tirelessly for the success of the second Synod of the Diocese of Juneau. Thank you for the great efforts of all involved. 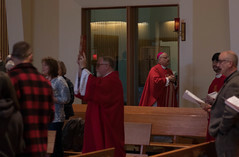 The Synod brought forth representatives from every parish and mission throughout Southeast Alaska. We deliberated and discussed the various themes that make up the work and mission of this local church. I found the Synod fascinating. I thoroughly enjoyed listening to the faithful of the Diocese as we addressed various issues affecting the members of the Catholic Church. It is my hope to review the proceedings and revisit the resolutions. After having heard our diocesan representatives speak to these topics and reading their comments as well as how they prioritized the topics, I will draft a post-synodal pastoral letter. This pastoral letter will help guide future policies and procedures for the Diocese. I will then begin a tour of the Diocese, similar to my pastoral visits during the Year of Faith, and spend time in the parishes presenting the fruits of the Synod. The outcome of the Synod will bring forth new beginnings in the work of the Church of Southeast Alaska. And one last point that reflects new beginnings—we recently began a new liturgical year. The first Sunday of Advent begins a new year in the Church. This liturgical season is the opportunity for us to prepare ourselves for the coming of Jesus Christ. We do so by making straight the paths of our lives, as John the Baptist reminds us, and by embracing a spirit of repentance. An opportunity for us to celebrate the Sacrament of Penance is at the very heart of what we are called to do during this Advent season. There’s no better way to prepare ourselves to receive the Savior into our hearts than by first purifying our hearts with God’s grace and forgiveness. I pray that this Advent season will be a source of new beginnings for you and your loved ones as we prepare for the coming of Jesus Christ. As we continue in these days before Christmas, I ask God’s blessings upon you and your family members.